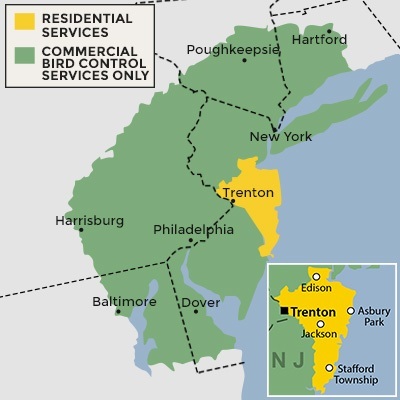 Cowleys Pest Services works in Mercer, Ocean, Monmouth, Middlesex County and areas nearby to help you prevent and get rid of unwanted wildlife that is coming too close to your home or commercial building. With Cowleys Pest Services, you’ll have a local, New Jersey pest control company with resources large enough to quickly get to your home or business, but small enough for you to be a highly valued customer. Just contact us to get started. We work in the towns listed below and nearby. Not sure we work in your town? Just give us a call or email and we will let you know. Cowleys Pest Services services Mercer, Ocean, Monmouth, Middlesex County including Edison, Woodbridge, Lakewood, Brick, Toms River, Piscataway, Trenton, Middletown, Princeton Junction, Old Bridge and surrounding areas.